Last year, Facebook launched a new feature called Find Wi-Fi on iPhone and Android, but it was only made available in a handful of countries. The new functionality would allow Facebook users who are traveling to find Wi-Fi hotspots nearby. Well, starting today, Facebook announced that it's expanding the availability of Find Wi-Fi globally on both the Android and iOS platforms. 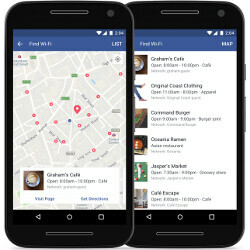 Users who receive the feature on their smartphones will be able to locate available Wi-Fi hotspots that have been shared by businesses with Facebook from their Page.